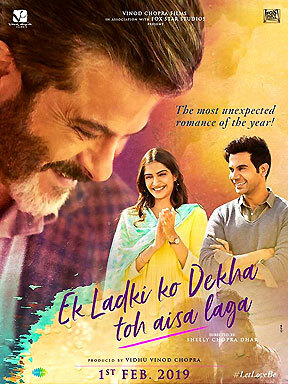 A confusingly promoted film presenting a bold issue in the format of the latest Bollywood formula, EK LADKI KO DEKHA TOH AISA LAGA remains largely unconvincing and gets marginally saved by the two veteran actors and its rare subject matter. But before mentioning the details, it needs to be told that the review of the film cannot be written without revealing its only twist and thus you can skip it if you wish to watch the film first. EK LADKI KO DEKHA TOH AISA LAGA had a confusing promotional strategy as the makers strangely decided to hide which was evidently visible and clearly suggested in the promos itself, that it was all about intimate relationship between two girls or a lesbian couple. Now whether they did it fearing from the usual fanatic groups or to avoid any early controversies cannot be said, but they probably did that in order to create curiosity, which sadly couldn't work in the desired manner. In my personal opinion, it would have been much better if they had openly played the card instead of questionably hiding it in their transparent sleeve. Interestingly the same confusion can also be seen in the film, when it doesn’t come to the point and refuses to reveal its basic plot in the entire first half till the intermission. So most of its first half gets spent in introductions, forcibly added comical sequences and a completely familiar portrayal of a Punjabi family (moving to Punjab) with typically loud and stereotype characters added in the script just for the sake of it. Here one also doubts that whether they brought in a Punjabi family backdrop to keep it safe or just following the latest Bollywood formula? Coming to how it exploits the formula, it exactly follows the set up as seen in the hit films like VICKY DONOR, DUM LAGA KE HAISHA, SHUBH MANGAL SAAVDHAN and the recent BADHAAI HO, where we have a familiar middle class or north Indian family in the backdrop and then an unusual, taboo or sexual issue is brought in which has never been there as the core subject of a mainstream Hindi film. All the above four films have this formulaic structure behind their basic storytelling and each one of them tackles a different issue related with an Indian family. Walking on the similar path ELKDTAL also does the same as it begins focusing on all relatable real life characters and a rich Punjabi family in its initial hour and then throws in the taboo subject just before the intermission creating a family tension. However there happens to be a huge difference between the formula of the four hit films and ELKDTAL in terms of the issue brought forward. Where the subject in all the above films strictly remains within the set traditional parameters and never questions the accepted norms or relationships of our society, ELKDTAL breaks these accepted norms and supports a revolution where a girl dearly loves another girl, willing to marry her and looking for a supportive consent of her family ignoring the society as a whole. And that’s exactly where the too casual, light hearted Punjabi setup doesn’t work as the theme is not any comical one in reality, that can be readily accepted by a father or an Indian family. Moreover, since the makers present it as a social comedy instead of a socially relevant powerful film, it doesn’t really serve the purpose and you don’t really feel like seeing something significant on the screen having immense revolutionary value. In addition the film also doesnt bring in the desired impact, as we don’t get to know any details about the other girl in focus, making it an unbalanced relationship in the storyline, simply concentrating on the STAR. At times the narration also tries too hard to make you laugh and the insertion of drama sequence in the end doesn’t come up as effective it should have been. 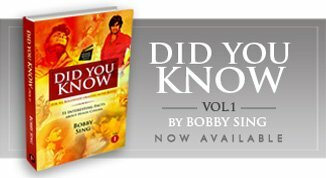 Plus its technical department is just okay with the soundtrack once again disappointing with an over-influence of Punjabi songs/lyrics including a reprised RDB melody that could have been used as it is making it more beautiful and nostalgic. Having said that, ELKDTAL still partially works in its courage to support a cause which earlier was seen in only a few ventures like FIRE and the films made by writer-director Onir. It works focusing on the issue with a sincere respect and isn’t interested in making fun of its characters in an uncaring, foolish way as seen in DOSTANA (2008). It thankfully has an honest and unapologetic portrayal of lesbian relationships on screen involving a conservative north Indian family for the very first time and hence accomplishes the task as a progressive film. But how I wish they had done it in a more realistic, powerful way instead of following the set Bollywood formula of presenting it as a light hearted comedy. Giving you the exact picture, the script only works in its sensitive, emotional outburst in the climax and the sequence excels reaching out to the viewers forcing them to think about it in a serious mode from the point of view of a father. And lastly what really saves the attempt is the spirited, entertaining act of Anil Kapoor and Juhi Chawla in particular who literally remain the two strong pillars throughout. Especially Juhi Chawla is quite funny in her intentional hammy form as Chhatro saying ‘Mind Shattering’ repeatedly and Anil supports her well as the single father interested in the single lady. Among others Sonam underplays it well as the lonely, shy daughter, whereas Regina Cassandra looks much more beautiful asking for your attention. Rajkummar Rao is just fine as the male hero, Abhishek Duhan is impressive as brother Babloo and Madhumalti Kapoor is entertaining as the elderly mother. But the director sadly doesn’t give anything significant to do to the otherwise talented actors such as Seema Pahwa and Brijendra Kala. In short, EK LADKI KO DEKHA TO AISA LAGA isn’t any well-written or well-made film made on a bold taboo subject. And that’s because the makers willfully conceived it as a too careful, subtle and unconvincing comic family drama, instead of a powerful revolutionary film eyeing at the box office.